Creating a sense of craze amongst bead aficionados is our classic range of silver & gold foil beads, which is ideally used in different purposes such as imitation jewelry, apparels, fashion accessories and multitude of other applicable areas. Our silver foil glass beads and gold foil glass beads radiate a charisma, that reflects an appealing imagination. 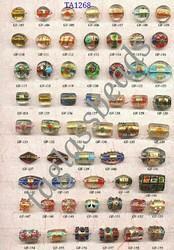 Buy Gold foil beads directly from the manufacturer in all colors, shapes and sizes. These beads give rich look to Jewelry. Rectangular Silver Foil Beads are one of the most popular beads that come in a rectangular shape and are made using silver foils. These beads are available in various attractive colors and offer a luxurious look. They find vast application in necklaces. These silver and gold foil beads when ooze a delicate beauty through magical colors & beguiling designs, look extremely splendid. Finest Big Hole Beads Silver Foil made of glass and available in different colors & Shapes. Handcrafted silver foil beads look absolutely beautiful, while they are put on casual as well as formal dresses. Silver Foil Beads are available in attractive shapes and sizes. These beads give a striking look. Varied shapes and sizes are available in furnace silver foil beads.